More and more often over the past couple of years I am seeing students who have had Traumatic Brain Injuries. It’s sad to see the amazing growth in this population on my caseload. And it is also sad to see how under-served this population is in special education. Often, families believe that once the child is dismissed from rehabilitation that further services are not needed. Unfortunately, this is rarely true. What, exactly is traumatic brain injury (TBI)? Broadly defined, it is an alteration in brain function caused by an external force. Usually, this external force is a motor vehicle accident, a fall, a sports injury, illness, or abuse. The impact upon the student’s performance can be anywhere from mild to profound. The areas of impact include social competence (social interactions, social adjustment, social skills), language, reading, hearing loss, attention & memory problems, increased time to process information, difficulty with learning new things, difficulty with organizational skills, unintelligible or inconsistently intelligible speech, and more. Unlike some disruptions to functioning, being younger at the age of impact is not a positive. While we sometimes equate being younger at diagnosis with improved outlook, the opposite is usually true with TBI. The younger the child, the more likely there will be disruption to normal development as well as long-term consequences. While an adult’s already developed brain may show some improvement back to normal function following an injury, the young child’s brain is more vulnerable and has no developmental level to return to. Additionally, because of the often fluid nature of the injury, there may be increased consequences as time goes by. and more complex functions are required of the brain. 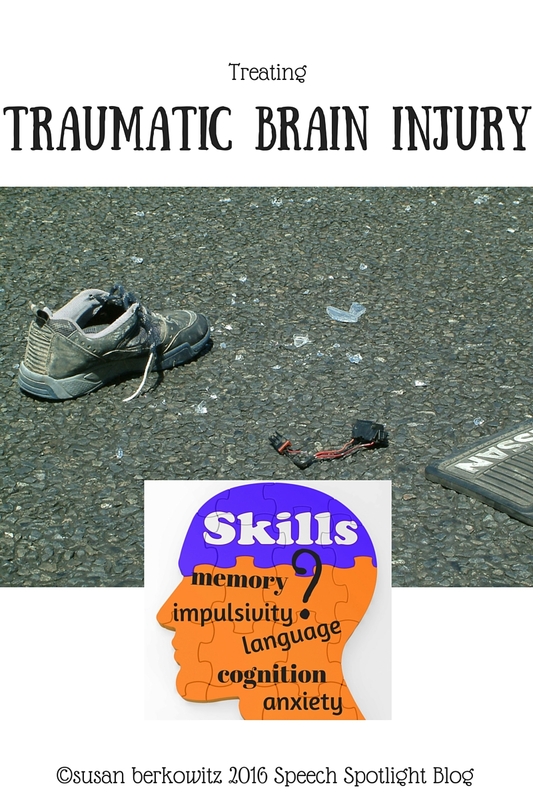 Unfortunately, for SLPs there are not many good assessment and treatment tools for us to use, and the problems faced by students with TBI are often more complex than the cognition & language deficits seen in other populations. They are often much more multifaceted in the foundational skills involved. When assessing students with less profound impact, we need to look carefully at social cognition, pragmatic language, and executive function as well as general language form and content. Discourse analysis is crucial; evaluating story retelling and conversational skills, as well as ability to speak on a topic. Often, a student finds it much more difficult to learn, remember, study, and organize. This can be overwhelming and frustrating. He may become angry. 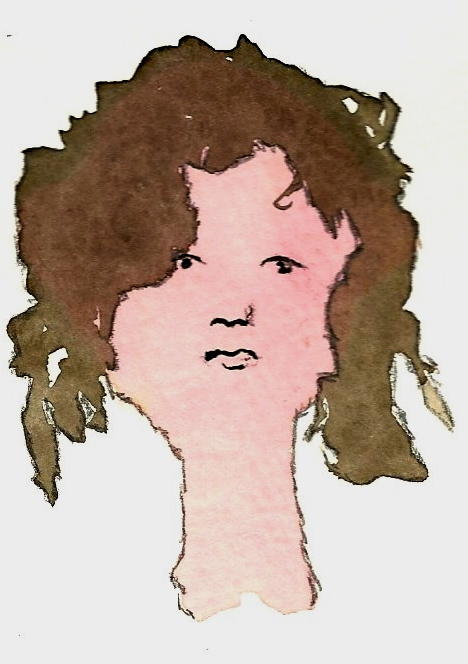 He may become socially isolated; as interactions with peers are more difficult. 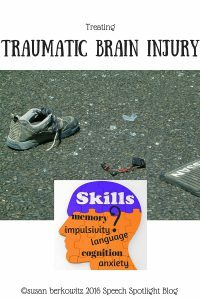 Students with TBI may become impulsive; grabbing at items and people, running off, having tantrums or outbursts, being rude and insulting. The student may have mood swings, may fatigue more easily, and is usually easily overwhelmed. Therapies will likely be required long-term, and the transition beyond school can be more difficult. In some cases, such as most students who land on my caseload, the language impact is so severe that use of AAC (augmentative communication) systems is necessary, either as a primary mode of communication, or as a repair strategy to augment speech when the student is unintelligible or when (s)he cannot retrieve the words needed. There is evidence in the literature that context-dependent, functional intervention is more successful for students with TBI than our usual impairment-based interventions. Students need direct functional experiences with skill building for the specific contexts in which they will use the skills. Any strategy or skill that is taught needs to be put into real world application explicitly. Material needs to be repeated and paired with visual and auditory cues. Creating a plan for each language activity needs to become automatic. The student needs to learn not only the strategy to apply, but the process of planning which process to use, how to apply it, and reviewing/self-monitoring whether it worked. Unlike much of our language intervention, we need to address specific situations, rather than individual skills. What else can we do? Work with teachers to make sure that the student has frequent breaks to address fatigue, has directions and tasks broken down into smaller units and presented one at a time, is given additional processing time for directions and explanations as well as additional time to formulate responses, is provided with an environment that is less distracting, and is given explicit direct instruction with ample feedback. We can also work in speech-language therapy on vocabulary building, understanding of non-literal language and nonverbal cues, problem solving skills and conversational skills, ad formulation skills. Obviously, every instance of TBI is unique. Location of the brain injury is crucial in understanding what functions and behaviors are impacted. Understanding that the underlying language problems often go beyond what our standardized testing covers will help clinicians plan for assessing and intervening with these students.